Theron sounds a little like classic Theo, and maybe a bit like a Game of Thrones character, too. Hunter has held a Top 100 spot since 1993. Call it a modern staple. Theron means hunter in Greek, from the word therao – to hunt. It disappeared from the rankings right around the time parents fell hard for Hunter. Ancient goddess Artemis was Potnia Theron – mistress of the hunt. Orion, another ancient name associated with hunting, is on the rise. So why not this one? An early bearer of the name takes us back to the 400s BC. Theron ruled Acragas in Sicily, and spent his reign waging war. Pindar mentions him in ode to Olympic champions; apparently, the tyrant was quite the chariot racer, too. It remained in use as a given name, if only on the fringes, over the years. A handful of eighteenth and nineteenth century American notables answer to it, too. An 1896 novel called The Damnation of Theron Ware seems obscure today, but remained known at least into the 1960s. Author Harold Frederic wrote the story of a Methodist pastor – that’s Ware – who questions his faith. I note the 1960s because writer James Blish borrowed Theron Ware for the name of his dark magician in 1968’s Black Easter, a novel that imagines demons overrunning the Earth. For reasons difficult to unravel, Theron surfaces as a surname in South African. Actor Charlize put it on the map, but she’s not the only one. It may be a place name; Thérond exists in France today. The village name comes from Occitan, and it may connect to the Latin word for height – torus. Or not. It’s a little blurry. My best guess is that the French name, heard in the Languedoc region, might have come to South Africa with the Huguenots, with a pit stop in the Netherlands. There’s at least one Frenchman with the surname who fits this description; he founded a South African winery. But it also seems like the French surname might have evolved separately from the ancient Greek appellation. Incidentally, Charlize and her countrymen pronounce it differently. 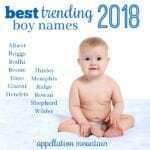 It sounds more like thron, but with a rolled R.
Greek or French, the name appeared in the US Top 1000 for boys most years from 1880 into 1992, peaking around the 1910s. There’s an uptick in the name’s use in the 1960s again. Credit a movie: 1960’s Home from the Hill, a family drama with George Hamilton wearing the name as the son stuck in the middle of many years of angst. Or maybe there’s another factor I’m overlooking. 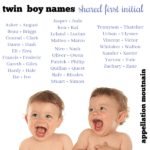 A few decades later, it might have fit right in with all those two-syllable, ends with-n names for boys. And yet, just as Dylan and Austin and Colin were leaping up the charts, this name was headed the opposite direction. Over the years, this has been the name of an obscure record label, a character in the World of Warcraft and a small animation studio. None of these are household names. There’s also Game of Thrones‘ Theon Greyjoy, but that’s a different name. And how about Theoren? Ice hockey player Theoren Fleury, formerly of the NHL’s Calgary Flames and a perpetual maybe for the Hockey Hall of Fame, puts his name on the map. Fleury also thinks the name – just maybe – to all of those other Theo- names, from Theodore to Theophilus. You might think of Thierry as the French form of Terrence, but it’s actually related to Theodore. So perhaps this one is, too. A mere 87 boys received the name in 2017. That qualifies as rare. And yet, it would wear well today. Like Theodore and Thatcher, it’s a Th- name. 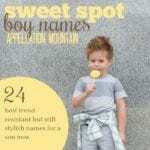 It fits right in with ancient choices that feel modern, and parents have yet to tire of those two-syllable, n-ending names. Clay Cook of the Zac Brown Band named his son Theron Maine in August 2018. They’re calling him Teddie, but Theo works, too. Overall, this makes for a great fits-in, stands-out choice for a son. What do you think of Theron? First published on September 18, 2008, this post was revised substantially and re-posted on December 5, 2018. I to am a Theron and love the name even though it is often mispronounced…I explain it by taking off the “T” which leaves heron (like the Great Blue Heron) and to then add the “T” back…then most people get it. My Dad named me Theron 8 years after seeing the 1960 movie “Home from the Hill” starring Robert Mitchum, Eleanor Parker, George Peppard, and George Hamilton who played Theron…so if you watch it you can hear the way my Dad heard it and loved it. I’ve only met 1 other Theron in my almost 50 years. Thanks so much for sharing your experience, Theron! And interesting – there’s a spike in the name’s use after that movie, so it’s definitely part of the puzzle. It’s a great, distinctive name. Hello all searchers of the name Theron. I absolutely love this name. I was doing ancestry research and realized that my two times great grandfather’s name was Theophilus. I was going through census records from 1870 and they refer to him as Theron. Has anyone ever heard of this before? Two VERY unique names indeed. Kevin, these are my FAVORITE kinds of comments! I’ve never heard of Theophilus called Theron, BUT I would say that nicknames were far more fluid 50, 100, and 200 years ago. So it’s possible that he disliked Theophilus and chose Theron instead. But census records are slippery things. My Italian grandmother Chiara came to the US and inexplicably appeared as Katie in census records. I’m not sure if she used the name Katie with American neighbors – it’s kind of a mystery, since Chiara isn’t Katherine – it’s Clare/Clara/Claire! So it’s equally possible that Theophilus was known as Theophilus to his friends & family – or by some other name entirely – but a recording error/misunderstanding led to him being called Theron. The thing is, of course, that Theron isn’t any more common than Theophilus, so it seems downright surprising that it would be the substituted name, right? Anyone else heard of this? My sons name is Therron (a lot of people think we are saying Darran). Popular in hockey as well — decent chance that the French and/or Canadian name Theoren is the same name, so you have the Canadian hockey player Theoren Fleury as a (somewhat) namesake. Our Theron really loves his name, and so do we! I like your name choice! I think you made the correct call on that name. I am a Theron. My parents were English teachers…. I recommend it highly. Odd without being outlandish, though pronunciation will throw people (I pronounce to rhyme with Darren, Aaron, Karen, Sharon). Hello, brother. I too am a Theron, son of two English teachers (professors, to be exact). Don’t know your age, but my folks were born in the ’40s, and English majors of that generation would all have read or at least known about a book called The Damnation of Theron Ware. My grandfather’s name is Theron and when I found out I was having a son, I immediately knew that I would be naming him Theron. I always thought it was such a strong name and because of the wonderful person my grandfather is, I just fit. There have been at least 5 men in my family named Theron that I know of (obviously my son being the most recent of the 5). I think that the nickname Theo is cute. However, my grandfather never had a nickname, not even as a child. My son doesn’t have one either, with the exception of his great grandmother calling him Teddy. 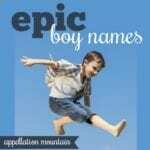 Many people think I made up my son’s name or I was choosing an obscure name to make it special. They are always surprised to hear that its an old name and one that is common within my family. We pronounce it THEER-in. I understand its more like the Greek pronounciation. Are most of you pronouncing it Ther-on? If I had a grandfather named Theron, I think I’d have to pass the name down, too! I pronounce to rhyme with Karen, Aaron, Sharron. So close if not exact to yours. Between 45 seconds and 58 seconds you can hear how she and South Africans say THERON and CHARLIZE. This is what Mr.Theron above is trying to show, but it’s a bit hard for people to really understand it unless they hear it. I had seen this video a couple of years ago and remembered it.Hope this helps clear the confusion! Just stumbled across this post from google where I was searching for a myth I had found long ago about the name. Apparently the first Theron also had one of the world’s first menageries and was not a hunter but collector of animals. I seem to be having trouble finding that information again. My Great great great grandfather was Theron and now my son is. We pronounce it Th-air-on. btw, Theron is my first name, not last name. LOL I just found this, this is awesome. I am linking all of my facebook friends to this. Hmm, cool outlook on my last name, I’d just like to tel you how we really pronounce it in South Africa, and I pronounce it myself. You say the “T” roll the “R” and end “on”, so it’s “Tron”, with the R rolled. However, here in the States I introduce myself as Theron, as “te – ron” So now you know! Pronounced “thrown” – that’s just fabulous! Thanks for digging, Jess. Thanks Jess! I knew I wasn’t crazy thinking she said her surname differently than I had always done. Theron, originally Greek pronounced THER-on meaning “Hunter”, or French pronounced THE-ro. Very interesting, I always assumed it was of German descent since DH’s grandfather is almost all German. Lola, thanks for asking – I’m feeling fine, but also quite ready to meet Clio in person. She’s developed an affection for kicking the exact same spot over and over again. And then some more. BTW, I ran round in circles trying to figure out *how* Theron is pronounced in South Africa – and in France. But no dice. Surely there’s a clip out there online somewhere of Charlize saying her full name, but I can’t find it. Jess, is THAIR en a French-ish pronunciation? I’ve heard that’s it is slightly different, and that meshes with my best guess, but I couldn’t confirm it. Corinne, I wonder if the Charlize connection is part of what’s making the name unpopular. Not that the actress isn’t appealing, but more that it makes a masculine name read feminine? I don’t know. I’m just surprised he’s not doing better. 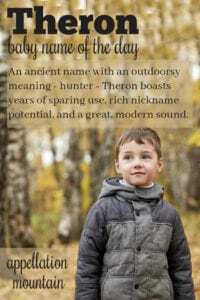 Theron is a two generational family name for us (DH’s great-great grandfather and his great uncle both had this name) and we waver on whether to use it or not. I do love Theo but neither of us love Theron. Perhaps because in DH’s family it’s pronounced “THAIR-en” so Theo isn’t quite as intuitive. We’re still mulling this one. Thanks for researching it! I read somewhere that Charlize Theron pronounces her name differently than Ther-on but can’t find it anywhere now, *shrug* I can’t get any other pronunciation out of Theron myself. With ‘N’ enders hot, a nice jazzy nickname option (The aforementoned Theo), I too puzzle why Theron’s not hotter. I’d be pleased as punch to meet one and would love to see him climb the charts again, Theron’s wicked cool!